This drawing by Katherine Brown is one of my favorites. 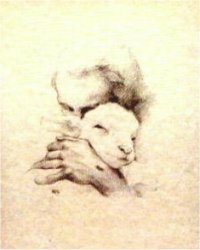 I think she captures the tender compassion of the Savior, as well as the confident trust that we, his beloved sheep, have every reason to exhibit. Well, I wish I could say that I always exhibit that confident trust - I sometimes fret, sometimes pout, sometimes feel overwhelmed, but He is always faithful, and I love to testify of His faithfulness, if nothing else, to help me remember it! Okay, so here's another example for you. There was a church that I had been wanting to visit and I finally found out last week the location of their meeting place. This morning I headed over there on my bicycle and was on the right street, but was having trouble finding the church. I saw a lot of shops, but nothing that said Gospel Commission Fellowship (they have recently moved and apparently have not yet put up a sign). I was scanning for some kind of clue, praying for help, and wondering if I had already gone too far or needed to keep going further up the street. Just then I saw a familiar face. It was Lois, my mentor from my first trip to Cambodia. I asked her where the church was, knowing that she was probably heading there too. I had just passed it by a few feet! As it turned out, she was the only person I recognized there, apart from the pastor, and I likely would have given up finding it if she hadn't been there right at that precise moment. I realize this is nothing earth-shattering, it wouldn't have been the end of the world if I had had to give up and turn back for home, just a bit frustrating. It was just another one of those little tenderness-es that He continually shows to this quivering little lamb of His to remind her that He is always caring for her. Stay close to the Shepherd, He won't let you down! I've been doing some thinking about the concept of trust. There are so many instances in all of our lives that require trust. When a loved one is sick we trust that the doctors and other health care providers know what they are doing. When we fly in a plane we trust that the pilot is sober and skilled. We know that people are not always trustworthy, but are continually faced with situations requiring us to operate on a certain level of trust. As I currently encounter a variety of new situations where I am dependent on the compliance of others I recognize that ultimately my trust has to be in the Lord. Recently I was stuck across town with a flat rear bike tire. As it turned out, I needed more than just a little air, I needed a new inner tube. A local repair guy offered his services. He had no shop, just an air compressor under an umbrella on the side of the road and some tools. It was the kind of situation in which I feel really vulnerable. I had no idea what a normal price would be or if this guy would do a good job since he's never seen me before in his life and may not see me again. I could have called a friend to come rescue me, but I decided to go ahead and trust, realizing that whatever happens, I have a trustworthy Shepherd who is watching over me and showing me abundant mercy as I attempt to make the best decisions I can in learning to face new situations in my new homeland. During Khmer New Year most Cambodians travel to the rural province where their family is from and my neighbors down the street invited me to go with them to their province. I thanked them very much but declined as graciously as I could. As much as I appreciated the offer and would love to accept it, I don't feel I have enough of a handle on the language yet to be able to tactfully decline participation in some aspects of the celebration for reasons of conscience, and I don't want to burn any bridges with this family! "Chol Chhoung (ចោល⁣ឈូង⁣) " A game played especially on the first nightfall of the Khmer New Year by two groups of boys and girls. Ten or 20 people comprise each group, standing in two rows opposite each other. One group throws the "chhoung" (a Cambodian scarf knotted into a ball at one end with a tail on the other) to the other group. When it is caught, it is rapidly thrown back to the first group. If someone is hit by the "chhoung," the whole group must dance to get the "chhoung" back while the other group sings. "Leak Kanseng (លាក់⁣កន្សែង) " This is like "Duck Duck Goose" but with a twist. The participants sit in a circle. One holds a "kanseng" (Cambodian scarf/towel) that is twisted into a rope & walks around the circle while singing a song. He/she secretly tries to place the "kanseng" behind someone in the circle. The person behind whom it is placed must pick up the "kanseng" and the twist is that, instead of chasing the person who dropped the "kanseng" he/she uses it to beat the person sitting to the right while that individual tries to escape by running around the circle. I don't know the name of another game we played but it involves throwing large brown pods from some kind of tree at the pods that the opposing team has set up in mounds of sand on their side. If you knock the right ones down your team wins but if you knock the wrong one down you lose. The winning team takes the pods so that they click against each other and hits them against their opponents bodies, usually on their knees. The following video is kind of a "staged" representation but I thought it would be fun to include it so you can hear some Cambodian music and see some Cambodian dancing (one of my Khmer teachers was trying to teach me how to do the same kind of hand movements). Also the games we played are shown, although I don't think any Cambodians would really be playing them all dressed up like this. The dresses worn in this video are very much like the dresses that people wear here for weddings if they can afford it.